a scene from a role play with Qanat, featuring their character, Loch! "You weird Kol-folk are all about bones and such aren't you? With your cutesy little nightmare fest, dancing skeletons in the red moonlight.."
Have I ever mentioned that I would marry Kviir without question? No? 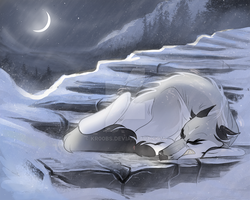 I love this bg, the snow is so fairy-tale beautiful. I love the exchange between these two characters, the way they sort of dance around each other verbally, you both write with so much skill that it's always a joy to read. This is BEAUTIFUL. I try so hard to compliment one or two things on stuff, but everything on this is just super lovely. 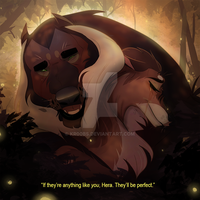 The bg looks like something right out of a picture, and I love the way you did both of them--their poses, their fur... They both look fabulous! ah, gosh ;; thank you so much, Winter'!! you look really good, i love how you draw so many things. it's where i get so much inspiration and ideas from, so tHANK YOU!! for that!! !